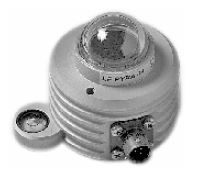 The LPPYRA 03 series are second class Pyarnometers designed for installation in the field. Measuring range 0-2000W/m2 in the spectral field from 305nm to 2800nm. It has a level indicator mounted in the housing for easy placement at any surface. It has an M12 connector (cable to be ordered separately). Calibration reprot included. LPPYRA03: typical sensitivity10μV/(W/m2, no power supply needed. LPPYRA03S: same specifications as LPPYRA03 but with built in amplifier to provide directly a serial output RS485 MODBUS RTU, power supply: 5…30Vdc. Please request actual delivery times and prices by contacting us. This product is not available online, but we are happy to make a quotation for you. Please contact us with your request.